I made this card for my daughter’s birthday twin. His mom (S) and I met when they were two months old, and our now three-year-olds are still in a playgroup together and even take a music class together. This past spring, my friend and I were pregnant again at the same time. I was due three weeks before she was, and I joked with her early in our pregnancies that it would be hilarious if we had birthday twins again. As we sat next to each other at her baby shower two weeks before her due date and eight days after mine, both having huge contractions, I told her she wasn’t allowed to have her baby before I did. Wouldn’t you know it? When I checked in at the hospital five days later, I checked Facebook and email and found out that she’d had her baby that morning. She was six floors above us at the same hospital. I told my husband, “Alright, we have eight hours to get this baby out.” Three hours later, S and I had a second set of birthday twins! We even got to introduce the babies the next morning in the hospital. That story has nothing to do with this card, but any time I think of the story, I have to tell it because I can’t get over how improbable it is. I mean, the number of things that had to happen with just the right timing boggles my mind. How would you even calculate the statistics on that? Anyway. The card. I love how the strip of Basic Black cardstock (embossed with the Chevron folder, though you can’t tell by the picture, and I didn’t upload the picture to make sure the detail was visible before Buttercup gave the card to her friend) hangs off the card on either side. That was actually not on purpose. I pulled some Real Red cardstock out of its file folder, thinking it was 4-1/4″ x 11″ — normal card size — but it was only 4″ wide. I kept it that way, because I liked it. I hope you have a great Saturday! We’re taking the kids to the pumpkin patch again after naptime, and then our Broncos play Nevada on the Smurf Turf tonight. Go Broncos! Only three days left! You can sign up for my October Stamp-of-the-Month Club through Monday. Don’t miss out! There are also only three days left to sign up to be a Stampin’ Up! demonstrator for only $25! That means you can sign up and get all the outstanding demonstrator perks, including the 20% discount, with no further obligations until April! 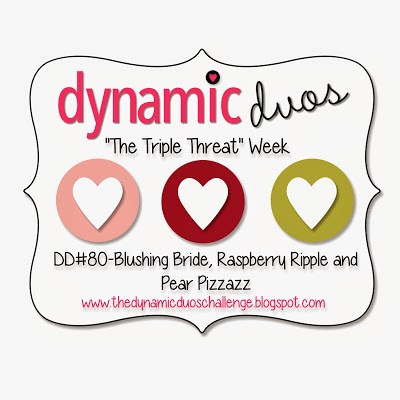 Email me about joining, or sign up at this link. 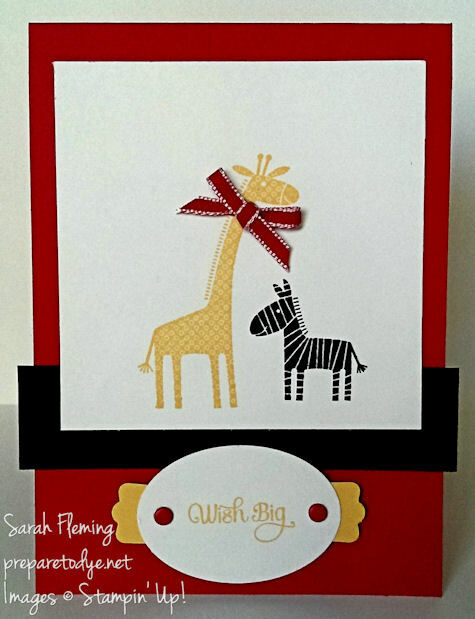 You can buy all the supplies I used to make my card in my Stampin’ Up! online store, 24/7. And don’t forget to check out the Weekly Deals! I’ve been working on baby scrapbooks, both 12×12 and 8×8. 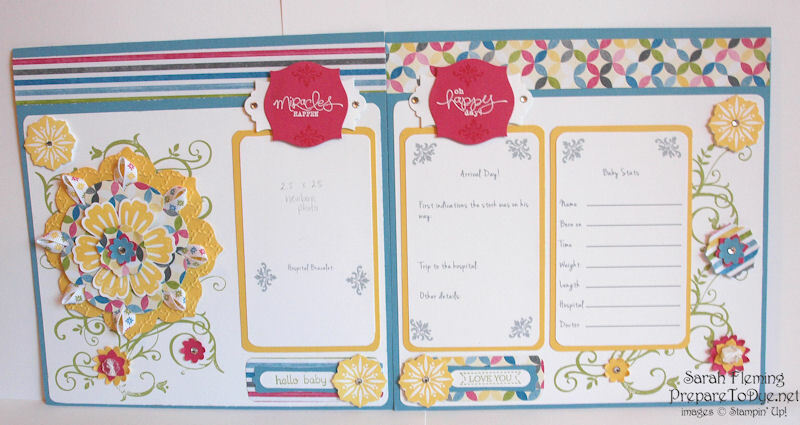 This is a 2-page 8×8 layout for recording details about the baby’s birth along with significant newborn stats. I started with Sunshine and Sprinkles DSP and went from there. I wanted something bright and fun that could be for either a boy or a girl, and this paper is perfect for baby books. I made the charts in My Digital Studio using Basic Gray and a free font I downloaded and installed. I printed out the charts on Whisper White cardstock, cut them out and rounded the corners, then added the little flourishes from the Tiny Tags stamp set. You can use any font installed on your computer in MDS (just make sure to scan them for viruses when you download them!). You can download a free 30-day trial of MDS here. The vines are from the retired set Baroque Motifs, but the current sets Flowering Flourishes and Everything Eleanor would work here too. The ribbon in the big flower is also retired, but you could use any coordinating ribbon, like the Marina Mist Striped Organdy Ribbon from the Spring Catalog. The small yellow flowers in the corners are from Baroque Motifs (cut with the smallest Floral Frames framelits die). 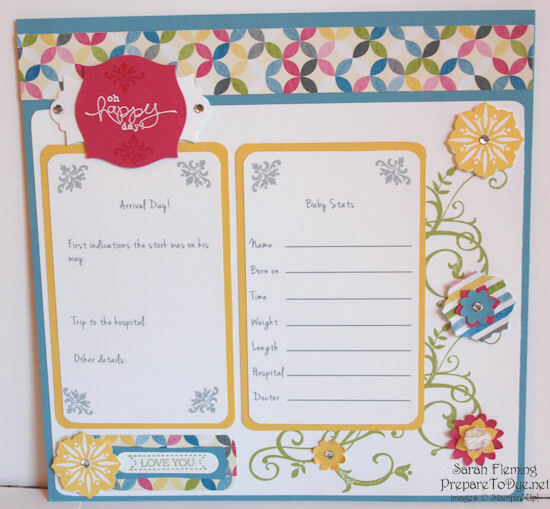 Other flowers were punched using the Boho Blossoms punch, one of my favorite ways to add a little extra to my pages. 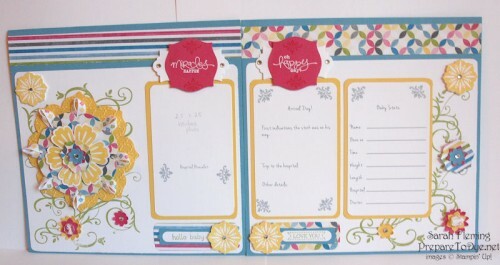 My favorite parts of the layout are the “Miracles Happen” and “Oh Happy Day” sentiments. They’re both from the Bloomin’ Marvelous Sale-A-Bration stamp set (sadly retired, but I’m really hoping the PTB will put it in the new catalog that comes out at the end of May). 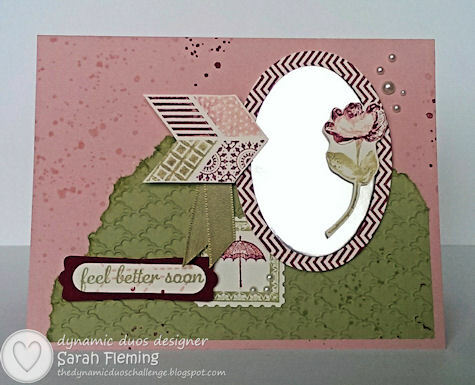 I embossed it in white on Melon Mambo cardstock (when I made the same pages for a boy, I used Pacific Point instead of Melon Mambo) and cut it (and the Whisper White backing layer) using Apothecary Accents framelits dies.